All insert arrangements show engaging view of pin insert. Insert arrangements for all MIL-DTL-38999 Series I, II and III are the same. For Series I and II, the insert arrangements are made by combining shell size (first two numbers) and the insert arrangement number (last two numbers). For example, a MS27468T23F35PC connector combines shell size 23 with the insert 35 for a 2335 insert arrangement in the MIL-DTL-38999 insert arrangement. For Series III, the insert arrangements are made by converting the shell size code to its shell size number (first two numbers) and combining it with the insert arrangement number (last two numbers). 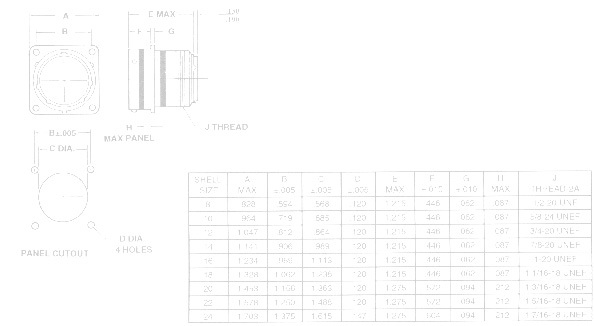 Insert arrangements are shown in numerical order by shell size and number of contacts in each shell size. Copyright © 2008 Allen Electric Connector Sales, Inc. All Rights Reserved.